It is extremely important to correct dental problems as they occur, and that means having a reliable dentist in Edmonton to call. 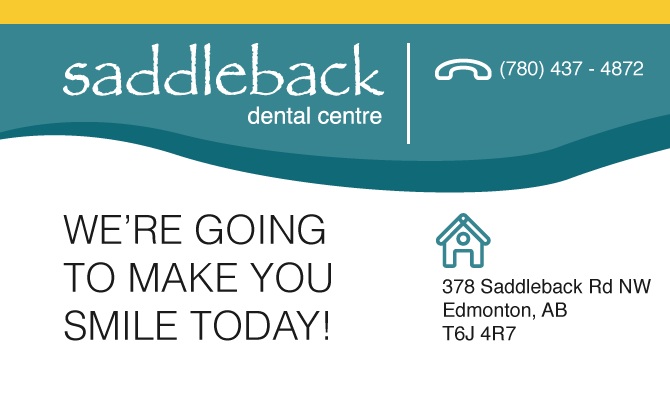 Here at the Saddleback Dental Centre, we have compiled a team of Edmonton dentists to meet all of your dental needs in a convenient, comfortable, and effective manner. We provide an entire suite of dental services—from cosmetic to preventative. Dr. Nizar Kherani, an experienced Edmonton dentist and owner of Saddleback Dental Centre. Practicing general dentistry since 1974, Dr. Kherani earned his Bachelor of Dental Surgery (BDS) from Newcastle University in England. He obtained first class honours in pathology, dental radiology and dental anaesthesia. Dr. Kherani then completed his education at the University of Toronto, earning his degree as Doctor of Dental Surgery (DDS). He continually trains and attends courses to upgrade his skills. Dr. Kherani began his dental career in England before moving to Edmonton and opening Saddleback Dental Centre in 1979. He is committed to offering family dental care Edmonton can rely on for healthy and beautiful smiles. Dr. Kherani is pleased to provide a complete range of dental care including cosmetic dentistry, restorative dentistry, prosthodontic dentistry and periodontal dentistry. He is also our lead dentist in dealing with diagnosis and treatment of Temporomandibular Joint Dysfunction (TMJ). Dr. Kherani is an active member of the Edmonton community. He regularly volunteers for leadership and fundraising activities to support organizations that he is passionate about. Dr. Kherani is proud to be a board member for Junior Achievement Alberta. Saddleback Dental Centre in Edmonton is pleased to have Dr. Tony Phylimon on staff to provide exceptional care to you and your family. Dr. Phylimon earned his Bachelor of Dental Surgery (BDS) from India in 1998. After moving to Edmonton, he completed his Doctor of Dental Surgery degree at the University of Alberta in 2006. Dr. Phylimon is interested and adept in all areas of family dentistry and is developing a specialization in cosmetic dental care for children. Dr. Phylimon is actively involved in the community and volunteers to support the Lions Club and the Rotary Club, providing dental care in impoverished and rural areas. Saddleback Dental Centre is happy to introduce Dr. Vidya Makkikana as the newest member of our highly skilled team of Edmonton dentists. Dr. Makkikana graduated from the University of Alberta, earning a Doctor of Dental Surgery (DDS) degree. Prior to achieving her doctorate, she earned her Bachelor of Dental Surgery (BDS) in 1995 from Government Dental College in Bangalore, India. She later moved to Kampala, Uganda where she gained extensive experience in treating all aspects of dentistry. Dr. Makkikana is committed to excellence and quality dental work while focusing on patient comfort and comprehensive oral health. She upgrades her knowledge and skills frequently by attending continuing education courses. Dr. Makkikana is married and enjoys spending her free time with her children, reading and participating in various outdoor activities.